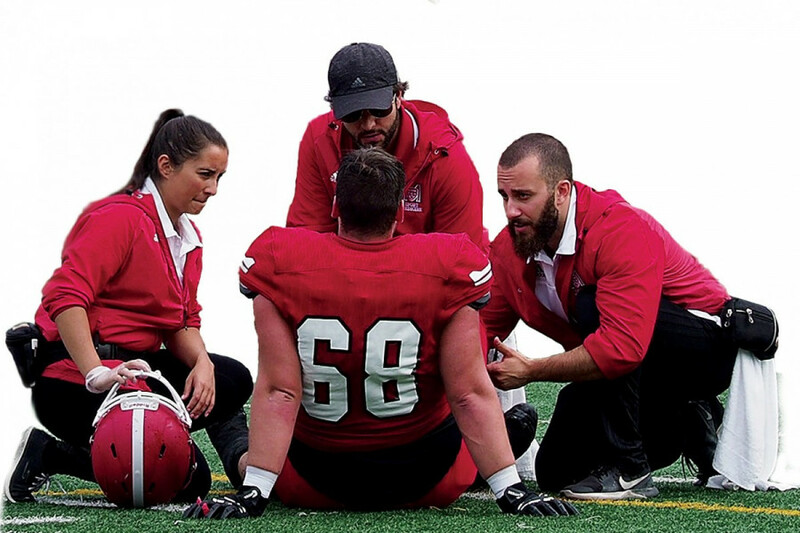 The Stingers were in Quebec City to play the Université Laval Rouge et Or on Sept. 24. Concordia quarterback Trenton Miller was running down the middle of the field, trying to move his team into better field position. Thirty yards into his scramble, Miller looked up and all he could see was a helmet. “I just felt it hit the side of my head,” Miller said. His and a Laval defender’s helmet had just collided. Everything slowed down, said Miller. As he opened his eyes, things became hazy. Miller was sidelined indefinitely and the defender was not punished for the hit. This instance is cruel, and unfortunately, it just may well be another statistic in football’s rapidly growing concussion epidemic—one that is now a growing business opportunity. Enormous television contracts between networks and sports leagues, apparel sales, and fantasy sports are all sports-related business opportunities that have turned into multi-million dollar industries over the years. In the last decade, companies have started exploiting something different: head injuries. Christensen then mentioned Lumosity, an online memory training program that claims to improve a person’s memory and problem-solving skills by playing games. A Lumosity membership costs $15 a month, which prompted the Federal Trade Commission to launch an investigation. They found that there is no medical evidence that memory games improve cognitive function. The FTC and Lumosity settled a $2 million court case because it was deter¬mined that Lumosity had run misleading advertisement campaigns. Just as Lumosity continues to profit on the fear of age-related loss of cognitive function, business people have seized the opportunity to profit on the fear of head injuries. When it comes to any industry, John Molson School of Business professor Robert Soroka likes to invoke the phrase “caveat emptor,” latin for buyer beware. He says that this is especially applicable to the concussion industry. The NFL has been in a lengthy legal battle with former players who have sued the league, claiming that it neglected the health risks related to the repeated head impacts a football player will receive over the course of their career. As a result, the NFL has started pouring hundreds of millions of dollars into concussion research. Business people have taken notice and concussions themselves have con¬sequently become an industry. Companies marketing protective mouth-guards, padded helmet caps, and even beverages as protective measures against serious head injuries have all helped to satisfy a market that a fear of concussions created. The NFL, and football in general, attracts more viewers and paying spectators than any other sport in North America. The league brought in $14 billion in 2016, and is only expected to see that revenue increase by the year as more consumers invest in it. Naturally, any public threat to such a lucrative industry is not going to be left unresponded. This doesn’t only apply to professional athletes, though. Parents have taken notice of the sport’s long-term health risks, and youth participation in football is declining. Since football is a particularly expensive sport to play, equipment companies find themselves making less money. Riddell, a leading football equipment company, released their “Revolution” helmet model in 2002. The University of Pittsburgh Medical Centre collaborated with Riddell on a study using high school football players as test subjects. It found that high school players using their model were 31 per cent less likely to become concussed. So of course, that model rose to the top of the helmet market in a hurry. In 2014, the Federal Trade Commission conducted a study of their own, and swiftly disavowed Riddell’s claims about the “Revolution” helmet, citing that the initial study by Riddell and the UPMC was poorly conducted. But in the 12 years between the two studies, the company had retired the 31 per cent claim. Riddell advertised it between 2008 and 2011, according to the FTC. In those years, they sold thousands of helmets based on false data. Parents, who were aware of the dangers of football, were more at ease with their children playing football if they wore the helmets. Since then, Riddell has released several updates to the “Revolution” model, and despite the knowledge that the helmets aren’t as protective as once thought, the company is still associated with head safety. “As soon as there’s a perception that a risk is mitigated, consumers are going to be interested,” said Soroka. These supposed innovations might not only be completely useless, but they might be detrimental as well. In thinking that they’re more safely equipped, players may allow themselves to play with reckless abandon. This is called the Peltzman Effect, and it’s something that poses a danger. Neurologist Harry Kerasidis writes in Psychology Today that people will behave according to the perceived risk associated with whatever activity they’re doing. In football, players feel more protected because of the enormous suit of armour they’re wearing when they’re on the field. Psychologically, football players feel more inclined to play dangerously. Kerasidis uses the example of rugby, where players play more carefully because they don’t wear as much protective gear, leading to fewer head-to-head collisions than in football. Soroka says that this all comes back to the main point—you can’t prevent a concussion. With head injuries being such a hot topic of conversation, people are bound to try making a quick buck. His recommendation to potential consumers of concussion products as well as all new health-related innovations is to be careful. Find out if any scientific communities have endorsed questionable products. Celebrity endorsement typically points to what he calls “unscrupulous” business, but legitimate endorsements from scientists don’t. Even then, Riddell got away with their 31 per cent promise for years. Kathy Cohen, the owner and founder of Neurocircuit, a clinic that specializes in concussions, says that the best way to handle head injuries from a medical standpoint is to make use of baseline testing. Doctors will test a person’s healthy, uninjured brain and catalogue specific data points which eventually combine to make up one’s neurological baseline. The same testing will then be done when a person is suspected to have suffered a concussion, and that will determine the severity of the injury. “Sometimes athletes won’t admit or realize they’re hurt and will want to keep playing,” said Cohen, who founded the company after her daughter suffered multiple concussions and finding out that the medical options to treat her were limited. “The best thing to do is to remove a player from the game and run a baseline test. That’ll help guide the trainer’s treatment,” she said. While Neurocircuit is a for-profit clinic, the service they provide is not a gimmick. Christensen confirmed that all Concordia athletes follow baseline testing, and that has been an important part of Miller’s recovery. At this point, Miller’s return to action is a process with little clarity. The details of the injury and the timetable for his return remain confidential, but he hopes that in following his doctor’s orders, he’ll be back. The research that McGill’s neurological department and Christensen does with the PERFORM centre at Concordia is important. Christensen, however, admits that research on head injuries has been a growing trend over the last five years. They’re elusive injuries that are fertile ground for an industry. While there is good research being done, science—scrupulous or not— isn’t the solution. Miller recommends updating rule books. But ultimately, the sports themselves are the problem. Football isn’t going anywhere—it makes too much money for too many people. So long as there is money to be made and young athletes interested in the sport, they’ll keep playing the games. Whether it be stricter rules, high-tech gear or cutting edge research, the brain-damaging hits won’t stop happening. Those measures serve only to justify the dangerous sports that people will be more than happy to profit on while athletes’ bodies continue to deteriorate. Maybe, it’s the sports themselves that the buyer ought to be wary of. In a previous iteration, it is stated that Soroka said that concussions are not preventable, which he did not. The Link regrets the error.